Real Time Gaming surpasses its own high standards with this newest offering, now available at Slots of Vegas Online Casino. With its superior graphics, the Gods of Nature slot game creates an enticing new world that’s just waiting to be explored. 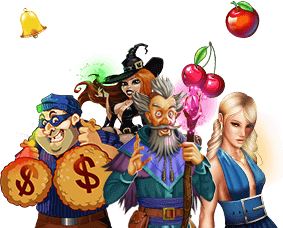 Sign up now with a deposit of just $50 or more for a 250% No Max Bonus plus 50 Free Spins with coupon FIRETEMPLE250. Visit the temples of old in search of the perfect harmony of the Five Elements of nature: Fire, Water, Earth, Wood, and Metal. The guidance of the Spirit of Sun and the Spirit of Moon will take you where you need to go. Look out for the Spirit of Sun, which serves as a Wild for all symbols except for scatters. On winning spins, he instantly doubles your prizes. The scattered Spirit of Moon will also be there to aid you in your quest, paying Any and triggering the Free Games feature. These are sure to pile on even more free games, increased prize multipliers, and bonus picks galore. Your vast riches are lying in wait! Gods of Nature is a 5-reel slot game with 30 fixed paylines, and the game offers you opportunity after opportunity to win free games and prize multipliers. With the 30 paylines set, all you will need to do is adjust the coin size according to your mood, preferences, and bankroll. Placing the maximum bet is highly recommended for the most optimal payout for winning spins. Gods of Nature is designed to accommodate all kinds of players. Whether you’re a penny slot enthusiast or someone who prefers to spend a little bit more on each spin of the reels, this game is for you. A 5-reel, 30-fixed paylines game makes it easy to keep the wagers for the game low or go high if your bankroll allows. The Autoplay feature is convenient and simple; just select your preferred a bet level, determine how many automatic spins you want to play, and just sit back and watch as the Scatter and Wild symbols pop up all over the screen. Wild Symbol: the Spirit of Sun The Wild symbol counts for everything except for scattered Spirit of Moon symbols. The Wild also doubles prizes automatically for winning spins. Scatter Symbol: the Spirit of Moon The Scatter symbol pays Any. The appearance of at least 3 scatters triggers the Free Games mode. 8 games with doubled prizes are added. Bonus picks are also awarded: 2 bonus picks for 3 scatters, 3 bonus picks for 4 scatters, and 4 bonus picks for 5 scatters. Up to 33 free games can be awarded with a 15x multiplier. Top award is 50,000 times the bet per line.